Greetings Partners and happy Fall! Collaborative members have been busy working on a variety of projects in the Zuni Mountains. Here are a few updates on what folks have been up to. 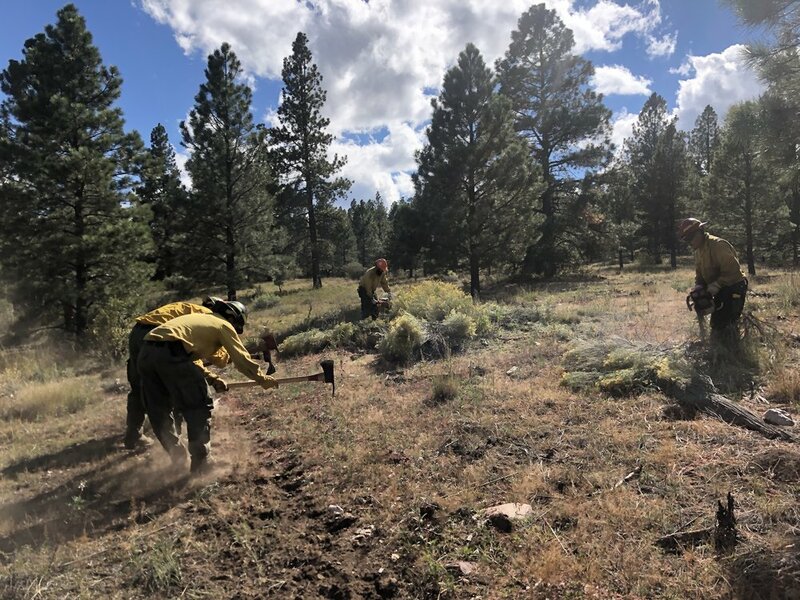 The Forest Stewards Guild was recently awarded a Collaborative Forest Restoration Program grant titled “Building capacity for prescribed fire in the Zuni Mountains.” A key component of that project is to employ a 10 person fire & fuels crew, based out of the Mt. Taylor Ranger District, that can help with prep work and prescribed fire implementation in the Zuni Mountains. The crew started on October 1st, right around the time when most seasonal Forest Service employees are ending their seasons. In addition to the on-the-ground projects the crew is accomplishing, training opportunities have also been a big part of the Fire & Fuels crew. By providing opportunities for crew members to earn certifications, such as Wildland Fire Chainsaw use (S-212) and New Mexico Forest Worker Safety, participants will have improved employment opportunities when they complete the program. While weather limited the amount of prescribed fire implemented in the Zuni Mountains this fall, the thinning, pile building, and line construction the crew accomplished will help set the Mt. Taylor Ranger District up for successful burns in the future. The same weather that has limited prescribed burning in the Zuni Mountains made scheduling the fall water quality trip a challenge as well. Both monitoring sites, which are habitat for the endangered Zuni Bluehead Sucker, are remote and difficult to reach. One of the sites, Tampico Draw, is in the bottom of a steep walled canyon. Not a great place to hangout in during a thunder storm! Eventually, the clouds cleared and project partners from the Forest Stewards Guild, Great Old Broads for Wilderness, and the NM Native Plant Society made their way to the Zuni Mountains on October 24th and November 1st. The Collaborative has been collecting water quality data in Agua Remora and Tampico Draw since 2013. Data is collected on fine sediment, temperature, pH, level (depth), dissolved oxygen, electrical conductivity, and total dissolved solids. Forest restoration treatments are planned for the western half of the Zuni Mountains (near where the WQ sites are located) in the future pending a decision on the Puerco Project proposed action. By collecting baseline data in these important habitat areas, project partners will be able to track any potential changes in water quality that might result from forestry operations. 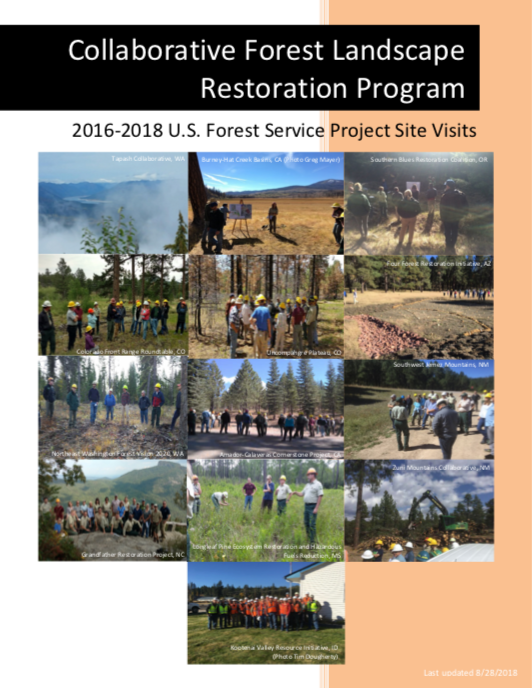 Between 2016 and 2018, Forest Service staff from the national office in Washington D.C. visited 13 of the 23 CFLR projects around the country, including the Zuni Mountains CFLR. A summary of those visits and the lessons learned from them, is now available on the resources page. Additional resources can be found in the Forest Service CFLR Resource Library. New and long-time members of the Zuni Mountains Collaborative gathered at the El Malpais National Monument Visitor's Center in Grants July 17th and 18th to discuss the previous year of forest restoration work in the Zuni CFLR landscape. The agenda covered topics including socio-economic and long-term vegetation monitoring, partner updates from Shirley Piqosa of Acoma Forestry, implementation and Puerco project NEPA updates from the Forest Service. Eddie Baca, Acting Fire Management Officer for the Mt. Taylor Ranger District gave an excellent presentation that walked meeting participants through the events leading up to and during the Bluewater and Diener Canyon wildfires that occurred in the Zuni Mountains in April 2018. 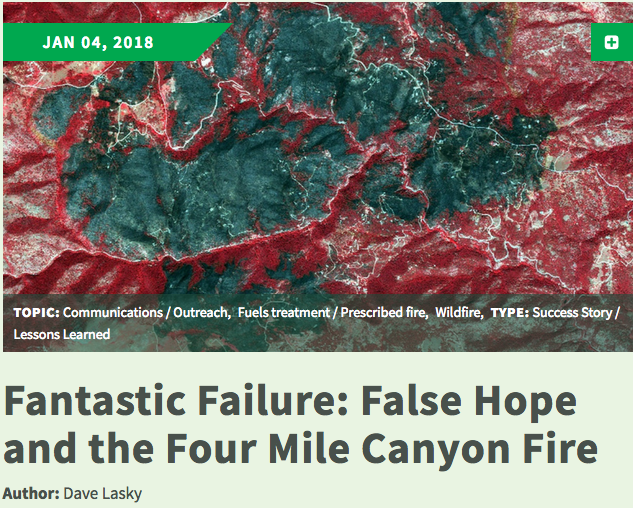 While the Diener Canyon fire did in fact start as a prescribed fire, that doesn't begin to tell the whole story. Several factors resulted in fire resources being spread thin, despite having more than twice the required personnel on hand. Three additional wildfire starts on the Mt. Taylor Ranger District on a day when wind speeds far exceeded what had been forecast created challenging conditions for firefighters. All of the starts were human caused, including one that fire investigators concluded had been caused by arson. Two of the three wildfire starts were successfully suppressed. The third, resulted in the Bluewater Fire, that burned 3,473 acres and prompted a pre-evacuation notice for the nearby communities of Bluewater Acres, Bluewater Village/Plano Colorado Estates, and the La Jara Subdivision. The Diener canyon fire burned predominately within the footprint of the 2004 Mt. Sedgwick fire, limiting the ecological damage and mitigating fire effects. On July 18th, meeting participants toured past and proposed treatment sites as well as areas impacted by the Diener Canyon fire. The field tour, which showed areas burned as part of the prescribed fire and subsequent wildfire provided important context for the previous days presentation by Eddie Baca. Below are links to presentations and resources discussed at the meeting. The Cibola National Forest is accepting comments on the proposed action for the Puerco Landscape Restoration Project until August 30th. The proposed analysis area is approximately 81,00 acres and includes 49,359 acres of mechanical treatment with prescribed fire, 23,087 acres of mechanical treatment only, and 8,538 acres of treatment using prescribed fire only. The proposed action and environmental assessment can be found on the resources page. Thursday, September 20th, project partners will convene a scenario planning meeting to discuss the future of the Zuni Mountains CFLR. The meeting will be held at the El Malpais National Monument Visitor Center. 1900 E. Santa Fe Ave. Grants, NM from 9:30 a.m. to 12:30 p.m on Thursday September 20th 2018. Visit the event page to RSVP for the meeting by September 10th. Diener Canyon: 3 helicopters, 19 engines, 5 water tenders, 4 T1 crews, 4 T2 crews, 345 persons. Yesterday, firefighters completed containment lines along Deiner Canyon continuing into the eastern portion of Redondo Canyon along Forest Road (FR) 480. Low relative humidity and high winds increased flame lengths and fire intensity in the SW interior of the Diener Canyon Fire with black smoke visible from I40. The fire activity stayed within containment lines. Red Flag warnings during the daylight hours have compelled managers to conduct burn out operations at night. Night burnout operations helped reduce fuels on the eastern side of the fire from FR 425 to FR 480 aiding containment objectives. Firefighters will continue to secure the NW and E side of the fire using hand dug line and burn out operations. Crews are patrolling FR 480 and FR 425 to protect Bluewater Village and La Jara subdivision. Log piles and other fuels on the N side of the Bluewater Fire continue to burn. Fire managers expect the fire to grow towards the NE along the Reynold Draw; however; lack of fuels on the rimrock to the NE and SE should act as a natural firebreak. Potential still exists for spotting across the rimrock. Firefighters will use full suppression tactics to keep the fires from moving off public lands to protect the communities of Bluewater Acres, Bluewater Village, and Bluewater State Park. Today, crews on the Diener Canyon Fire will patrol and hold the containment line along FR 178, patrol and hold the burn out operations. Crews on the Bluewater Fire will continue to construct direct and indirect hand lines on the N side of the fire and from the west side of the fire to FR 178. Current Red Flag weather conditions will contribute to dangerous firefighting conditions. High winds will limit the use of aircraft during initial attack. Firefighters could be exposed to erratic fire behavior and the potential of falling trees while on the fireline. Fire operations will temporarily cease if the safety of firefighters is compromised. Pre-evacuations: All pre-evacuation orders have been rescinded, and the evacuation center located at Grants High School has been closed. Closures: A closure order has been issued for the Forest in the area of the wildfires. Bluewater Lake State Park is also closed to the public. A Temporary Flight Restriction (TFR) over the fire area is in place. Operating a drone or unmanned aerial vehicle in the TFR is also strictly forbidden, and dangerous to aircraft employed in fire suppression. Community Meeting: A community meeting will be convened tonight, Tuesday, April 17, 5:30 PM in the auditorium of the old Cibola County Court House at 515 West High Street in Grants. Status of the wild fire suppression efforts and related matters will be discussed. CFLRP funded at full level in fiscal year 2018 & New Factsheet. The Collaborative Forest Landscape Restoration Programs was funded at its fully authorized $40 million level in the Fiscal Year 2018 omnibus appropriations bill that was passed and signed on March 23. If you have not already done so, please take a moment to contact your Senators and Representatives and thank them for supporting full funding for CFLRP. This document highlights the successes and performance of CFLRP since 2010, and makes the case for a permanent extension and increased funding for CFLRP and future project investments. Share this document broadly with legislators and other interested parties in preparation for next years appropriation process. April 16th: Containment advances on the Bluewater and Diener Canyon fires. Rocky Gilbert, Operations Section Chief updates progress on the fires. Yesterday (4/15/18) firefighters continued the burn out operation on the east flank of the Diener Canyon Fire, along Forest Road (FR) 425. The burn out has resulted in a wide containment line, as six to ten inch flames slowly consumed light to moderate forest vegetation. This line is designed to prevent any fire from moving to the east toward Bluewater Village and La Jara subdivision, as a result of predicted strong, gusty winds from the southwest. Crews mopped up and patrolled the fire edge along FR 178. Fire crews completed confinement lines on the northwest corner of the Bluewater Fire, stopping movement of fire toward Bluewater Acres, but fire remained active in windrows of uprooted juniper trees on the north side of the fire. A heavy helicopter dropped water on burning fuel, assisting firefighters as they suppressed the flames. Today crews will continue the burn out along FR 425 east of the Diener Canyon Fire, bringing the containment line south to tie in to FR 480. Firefighters will patrol and mop up along FR 178, and may use aerial ignition to clean up unburned areas if necessary, weather permitting. Structure Protection crews will continue assessing prevention needs. Firefighters will patrol the fire’s edge around the Bluewater Fire, putting out hotspots wherever they find them. Fire is still active on the northeast corner, and helicopters will be used to keep the fire in check, weather permitting. Winds are predicted to be southwest 15 to 25 mph, with gusts to 25+ mph this afternoon. Strong wind may prevent use of aircraft in the afternoon. Community Meeting: A community meeting will be convened on Tuesday, April 17, 5:30 PM in the auditorium of the old Cibola County Court House at 515 West High Street in Grants. Status of the wild fire suppression efforts and related matters will be discussed. April 15th, 2018: The Diener Canyon Fire (6,106 acres) is burning on Mount Sedgwick within the old fire scar from 2004. The Bluewater fire (2,532 acres) is located approximately 4 miles north of the Diener Canyon Fire on Salitre Mesa. As of April 15th, pre-evacuation notices for the residents of Bluewater Acres, Bluewater Village/Plano Colorado Estates and La Jara subdivisions have been lifted today. The evacuation center has been closed at Grants High School. Despite the notice being lifted, residents in these communities should continue to have a plan in place should another pre-evacuation notice be necessary. While future evacuations are not anticipated, the fire remains active and high winds are predicted this week. Grants, NM - April 13, 2018: A combination of low temperatures, high humidity and light snow helped overnight as both the Diener and Buewater fires both experienced little fire growth through the night. Burnout operations on teh Diner Fire were completed during the night from Post Office Flats to Ojo Redondo Campground on Forest Service Road 480. All lines are currently holding. Both the Diner and the Bluewater Fires are estimated at 1,000 acres each. Residents of Bluewater Subdivision, Bluewatter Acres, Bluewater Village, and La Jara Subdivision continue to be on Pre-Evacuation notice. These residents have been asked to be prepared to leave at a moment's notice if an evacuation order is issued. In this event, an evacuation center ewill be located at Grants High School while the Grants Rodeo Grounds can be used to house livestock. Winds are predicted to continue today, although slightly lighter with cooler temperatures. Gusts are still predicted to reach 40 miles per hour. Firefighters from multiple agenciues and departments are assisting with these fires. A Type 1 Incident Management Team has been ordered to manage both fires. Members of the team began to arrive yesterday evening and will continue coming in today. They will work with the Forest to determin what tie they will assume command of the fires. The Bonita Fire (7.3 acres) and the La Mosca Tank (10 acres), which both also started earlier yesterday, are not currently posing any threats. The cause of all four fires is under investigation. The Zuni Mountain Collaborative was excited to lead a field tour of the Bluewater Stewardship Project during the recent Society of American Foresters (SAF) conference that happened in Albuquerque in November 2017. SAF followed the tour with an article in their monthly newspaper, the Forestry Source. We're happy to share the successes of the project with visitors from across the nation and honored to be included by SAF. Thanks to all of our partners and supporters that have gotten us to this point. Click the image below to view a PDF of the article. The National Cohesive Wildland Fire Management Strategy blog for the Western Region recently shared an article written by Zuni Mountains Collaborative partner Talking Talons Youth Leadership (TTYL). The article "Teaching Fire with Fire," was initially featured in fireadaptednetwork.org and shared the success of TTYL's outreach efforts to middle schools in the Zuni Mountain Landscape. Always nice to see the great work ZMC partners are doing getting national recognition! Read the article here. The Zuni Mountains Collaborative released an informational rack card. Access copies here.